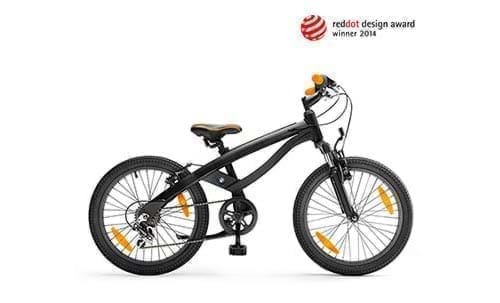 The BMW Cruise Bike Junior for boys and girls from six-and-a-half to nine years old. Grows with the child: the special angle of the seat bar of the sturdy, light aluminium frame offers the optimal seat position for various heights. With a suspended front wheel fork, child-friendly adjustable brake levers and a smooth six-gear Shimano grip-shift lever. Includes front, back, pedal and spoke reflectors and a bell in handlebar colour.